This was the exact moment that 15-year old Gus Hoffman began his long road to recovery. The whole thing began one afternoon last June when Gus, who is an experienced trail guide, was preparing to take a group out for a horse ride near his hometown of Big Sky, Montana. Wanting to make sure the trails were clear for the other riders, Gus rode out ahead to clear any debris that might be in the way. Nearly two miles out, things took a turn for the worse. Gus’ horse, Soldier, spooked and took off running. After quickly finishing what he was doing, Gus headed off after him. Just as he caught up with Soldier and went to reach for the lead, the horse spooked again, this time landing a strong kick to Gus’ throat. Gus was in bad shape. He reached for his radio to call for help, but the trauma to his throat left him unable to speak. “He tried to call for help on the radio, but he couldn’t speak, so he climbed back on his horse and rode over two miles for help. As he approached, everyone in the group just went silent. He slid off his horse and one of the cooks came around, grabbed him, loaded him into a suburban, and took off,” said Beth Hoffman, Gus’ Mother. Frantically radioing for help, the cook was able to get ahold of Gus’ father and relay what had happened. They decided to rendezvous at a point nearby where they would wait for the ambulance. Unfortunately, for Gus though, the road had been blocked by a semi-truck accident, to the north which meant that the ambulance had to assist with that accident and could not meet them. Knowing that time was crucial, the Hoffman’s took matters into their own hands and drove Gus to the hospital themselves. When they arrived at Big Sky Medical Center in Big Sky, the team of clinicians there decided it was in his best interest for Gus to be flown to Saint Vincent’s Hospital in Billings for care. REACH 24 in Bozeman, Montana received the call for air medical transport that day. On duty was Pilot Jordan Gipe, Flight Paramedic Thomas Hellman, and Flight Nurse Peter Anderson. 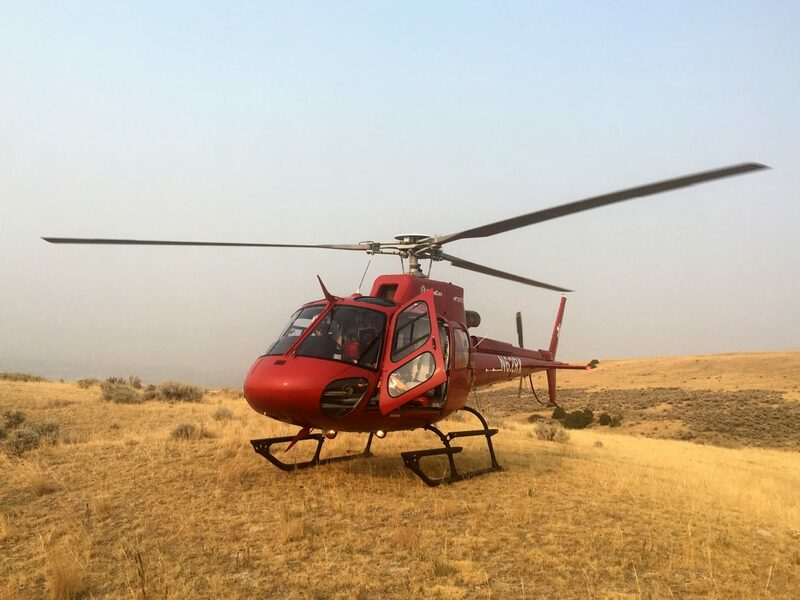 REACH 24 on scene near Bozeman, Montana. After introducing themselves to the Hoffman family, Thomas and Peter set to work preparing Gus and Beth for what they could expect on the flight to Billings. Because the flight from Bozeman to Billings is nearly 50 minutes long and 140 miles over open land, Thomas and Peter knew they needed to be prepared for Gus’ condition to potentially deteriorate while in the air. While both Peter and Thomas helped to manage Gus’ pain and keep him stable, Jordan kept his focus on safely doing his job while also keeping Beth’s attention. Being a parent himself, Jordan really empathized with what Beth was going through. Doing his best to keep Beth engaged in conversation, Jordan tried to point out different types of wildlife and scenery during the flight. Soon Jordan was safely landing the aircraft on the rooftop helipad at St. Vincent’s in Billings. There the team accompanied Beth and Gus down to the emergency department. After Thomas, Peter and Jordan left St. Vincent’s though, Beth was informed that she and Gus would have to take another emergency medical flight, this time to Salt Lake City, Utah. Gus needed to be in the care of a specialist at the children’s hospital there. In the end, Gus and Beth made it safely to Salt Lake, and despite suffering two collapsed lungs and undergoing a tracheotomy, Gus was released to go back home to Montana just a few short weeks later. While Thomas and Jordan will tell you that the part they played in Gus’ care was part of their jobs, neither of them walked away from this flight unaffected. And today Gus is back on the trails, both literally and figuratively. Beth shared with us that while Gus is still recovering, he has been enjoying time on his snowmobile, and his mountain bike and has even gone back to school part-time.